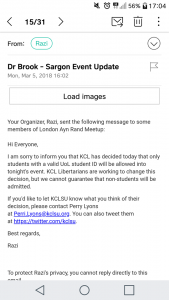 A mere two hours before the event was meant to happen, King’s College London Student Union has now arbitrarily decided to deny entry to non-students attending the Dr Yaron Brook and Sargon of Akkad live discussion of Ayn Rand. 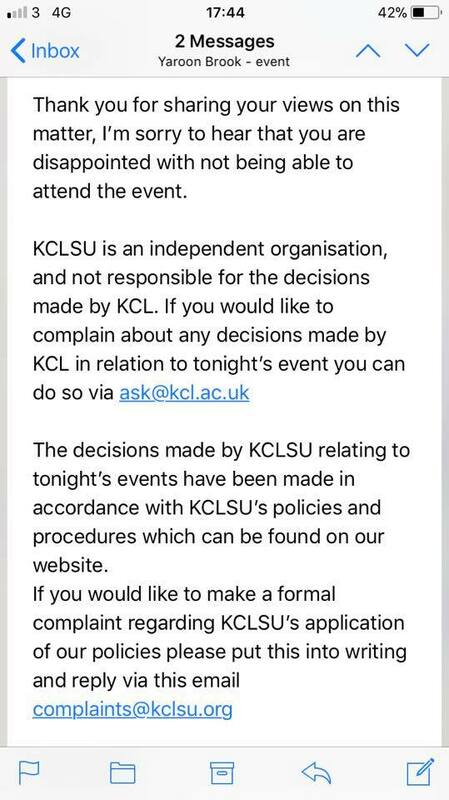 In an email sent out to attendees, many who have travelled from across the country, they were informed: “KCL has decided today that only students with a valid UoL student ID will be allowed into tonight’s event.” The organizer is currently trying to reverse the decision. 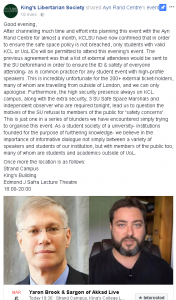 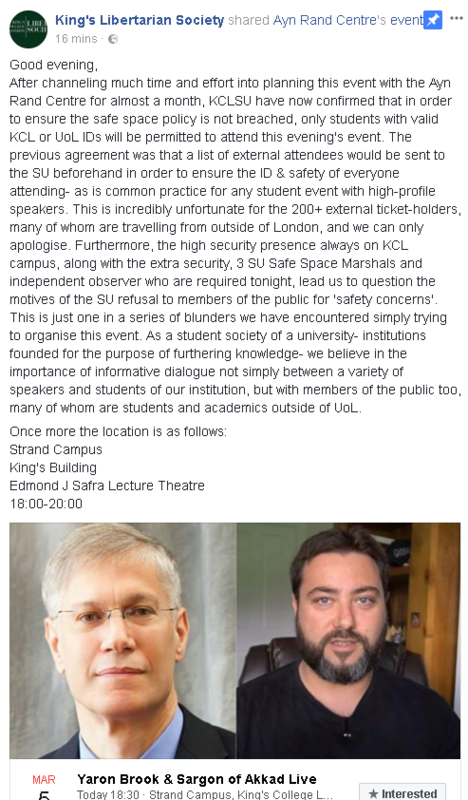 An hour before the event was meant to start, the King’s Libertarian Society posted on Facebook “KCLSU have now confirmed that in order to ensure the safe space policy is not breached, only students with valid KCL or UoL IDs will be permitted to attend this evening’s event.” How external attendees pose a threat to their ‘safe-space’ policy is yet to be seen or explained. 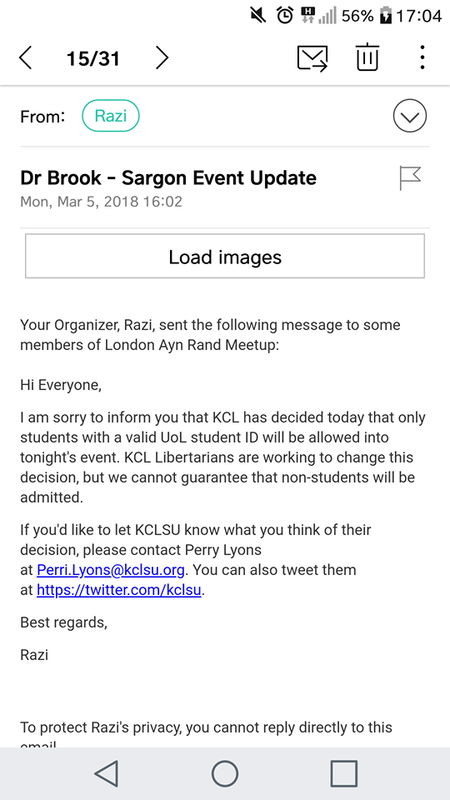 @kclsu have decided two hours before the event that ONLY students with a University of London student ID will be allowed into tonight's Yaron Brook & Sargon of Akkad discussion. 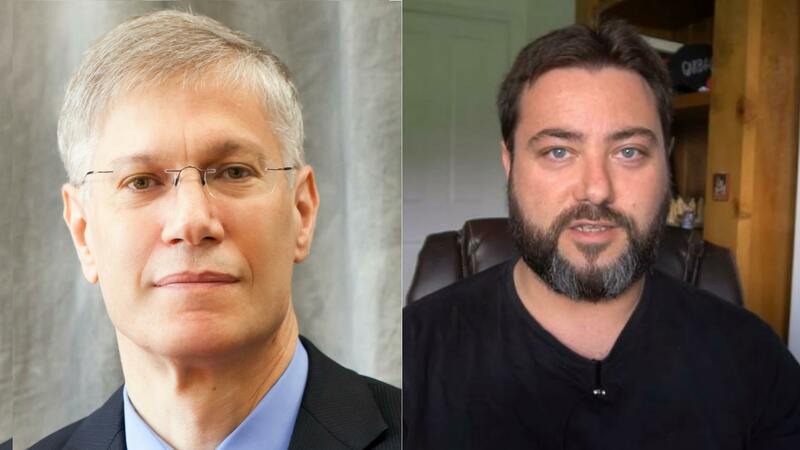 Friends of mine who were intending to attend the event told me how angry they are, one saying on grounds of anonymity (he doesn’t want to get fired from his job – that says it all about today’s current socio-political climate) he “hates SJWs” and another, Nav, said “I feel like Kings has given into fascist-like bullying from SJWs to have this event closed off to the wider audience”. 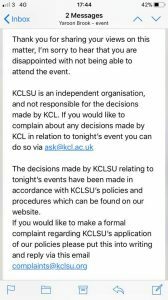 At the time of writing, King’s College London Student’s Union had written nothing on their Twitter or Facebook explaining their actions.